This modern home has the ultimate modern main floor. 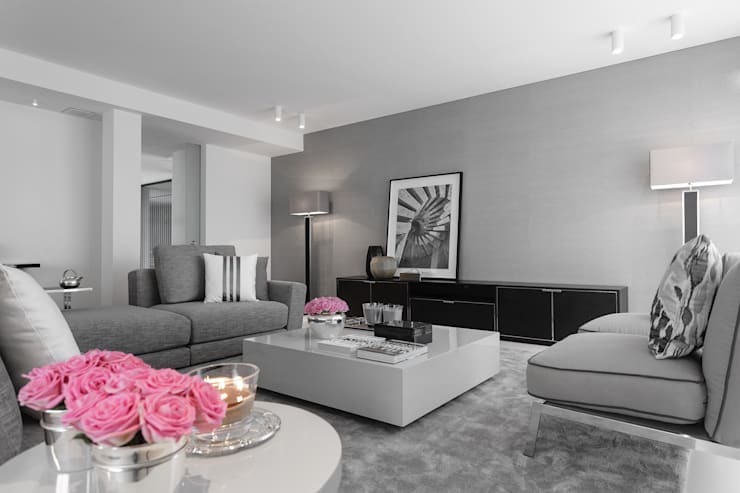 It's entirely in simple shades of grey except for a single pop of colour in each space. This house is unity and continuity done perfectly, without sacrificing the small touches that give each room their distinct character. 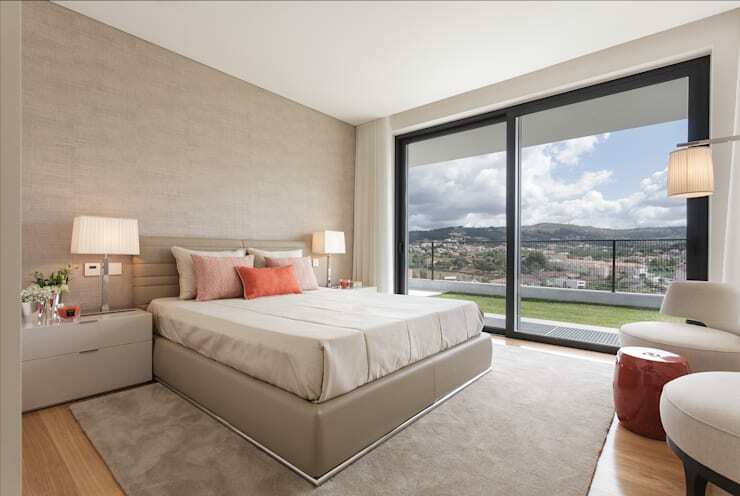 Designers Casa Marques Interiores have outfitted this amazing home in Portugal with a huge swimming pool, a distinct and masculine conference room, and a creamy orange bedroom that's sure to surprise. Let's get started! This amazing exterior feels modern and luxurious at the same time. The bold black and white facing gives this flat rectangular building some visual interest. The huge swimming pool is a shining feature, especially with the edging in the same bright white of the awning and patio furniture. The only big surprise here is the single pine off to the right, its not often we see a lone tree in an otherwise plant-less exterior, but it adds some life to the pool area anyway! An all-grey interior is a wildly different idea and it creates an amazing atmosphere for this living room. Everything looks soft and smooth. It would be an amazing room to relax in. We also love the pop of bright pink roses, that seem to exist to prove to us that the room hasn't been edited to appear grey! They also give us an idea of how colourful and animated the family members would appear to be in the room. While it incorporates the same lovely pink flowers as the living room, the bathroom offers a break from the all-grey theme of the main floor. 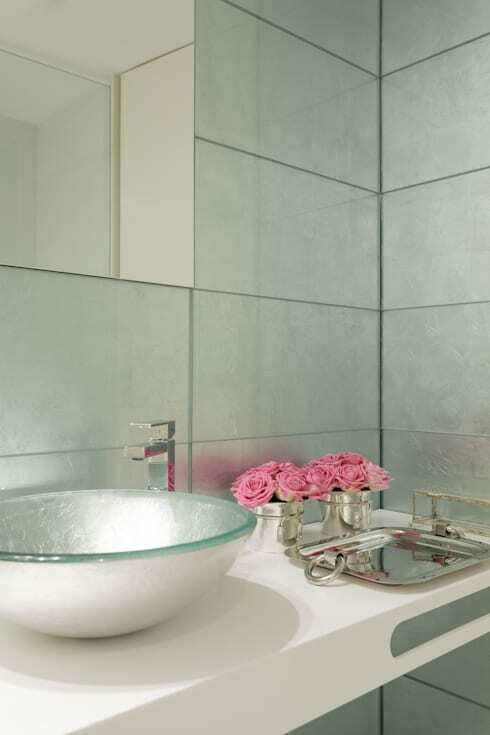 The frosted tiles and sink add a cool elegance that feels refreshing. We particularly enjoy the use of silver pots and platters in this space. Their metallic shine works well with the blue frosted glass and makes the room feel evern brighter. In the kitchen we return to the grey theme of the living room. Here the modern elements are even more distinct. 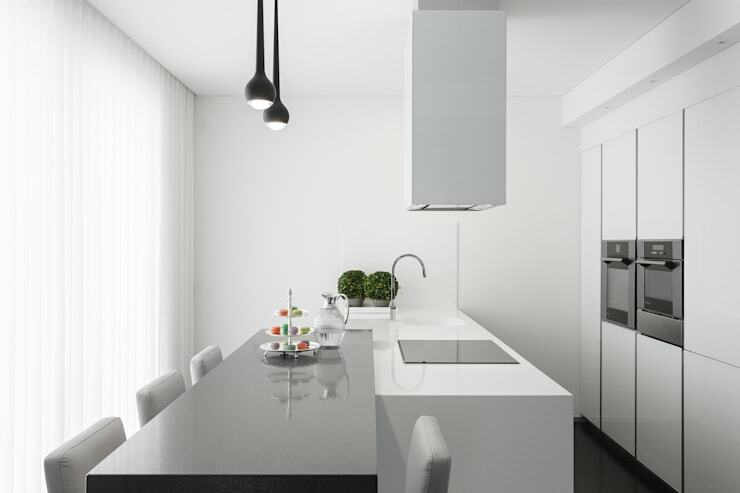 The rectangular range-hood is an excellent modern feature that emphasizes the simplicity and clean lines of the room. On the right we can see that the kitchen cupboards have no handles, which is an excellent decision to rid the room of any cluttery elements and maintain the feeling of minimalism in the space. This dining room could easily double as a conference room. Its simple metallic centerpiece is classy but not distracting. The overwhelming balance in the room, mainly created by the table and the two lamps on either side of the wall art, is pleasant and comforting. 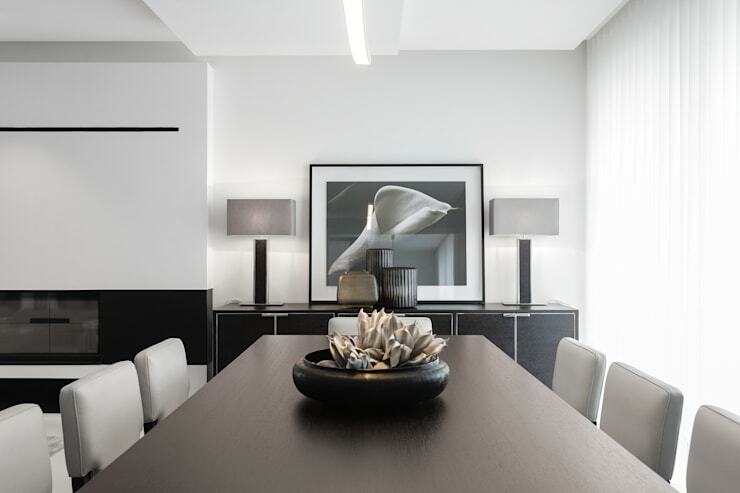 The grey-theme heightens the masculinity, as does the absence of any colourful accent. 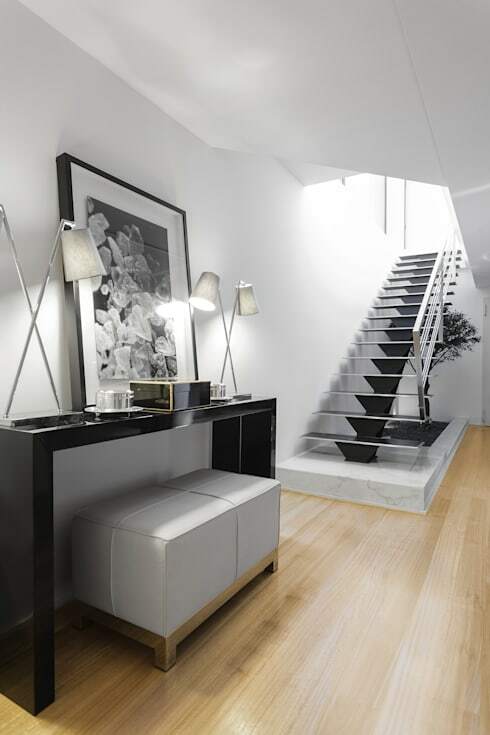 As we head to the next floor the stairway offers a decorative focal point. The balanced lamps create elegance, and the brilliant storage of seating beneath the side table adds some functionality to the space. Otherwise, its a lovely spot to display some favourite art and store some romantic candles. What might have been a wasted space in a more minimalist design has become a multi-function area that adds some character to the home. The stairway can be a challenging place to decorate, but homify has you covered with an amazing gallery full of stairway ideas! And we thought the living room was soft and calming! 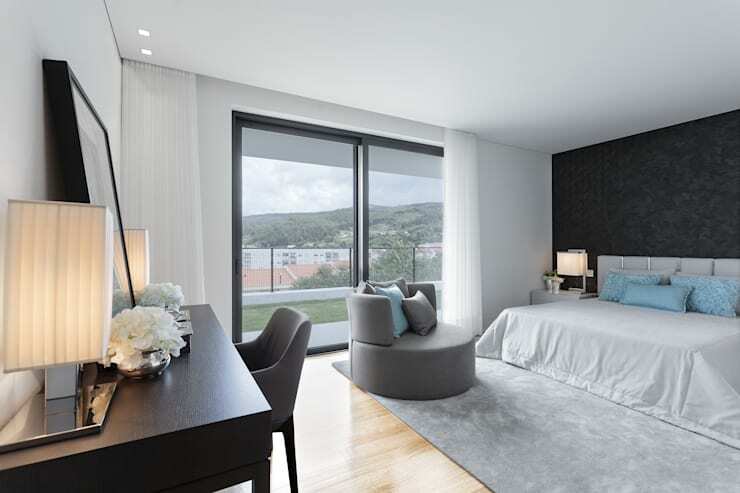 Everything in this bedroom has been chosen to create a comfortable and bright space. That unique modern chair is a focal point of the room in its soft grey fabric and decked out with pillows. The bright blue pops of colour in the room provided by a few pillows feels sophisticated and calming. Though, if we had to choose the best feature of this room it would have to go to the careful use of black. That back wall and the door trim add the high contrast the room needs to feel bright and distinct. Surprise! The second bedroom abandons the grey theme entirely and instead relies on a soft cream to create a calming tone. With the subtle orange accent this room feels warmer than the last, but just as sophisticated. Again, the designers have made great use of black on the door's trim, it makes the whole room feel vivid! If you've been inspired by the soft and modern design in this house you'll enjoy this home that was perfectly designed for a family of four. Do you think the all-grey theme works for this home? Let us know in the comments!